While finishing graduate school at Western KY University, Mike Toadvine began selling for the Clayton Company. At the time, they were selling park and playground equipment in Western Kentucky. 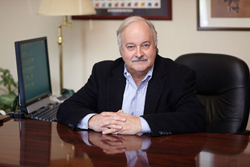 As business grew, Mike relocated to Louisville, KY in 1976. Shortly after that in 1979, Clayton Company became Dant Clayton through the acquisition of a metal bleacher manufacturer out of Alabama. The change in name helped to re-brand the business into a more full-service manufacturer and distributor. Toadvine Enterprises traces its roots back to a point when Mike Toadvine bought the rights to distribute Dant Clayton products in Kentucky. At the time, Dant Clayton manufactured metal bleachers and maintained a sales and distribution team. When they decided to just be a manufacturer, it was a natural transition for Mike to purchase rights to the distribution...thus began the start of Toadvine Enterprises as we know it today. Since the late 1980s, Toadvine has become a strong brand name throughout Kentucky, Tennessee, Indiana, and parts of Ohio. As business has changed, Toadvine Enterprises has adapted to industry changes. The business has always been passionate about servicing customers and as a result, the product line offerings have grown from outdoor bleachers to indoor seating for gyms and auditoriums, athletic equipment including ball goal and volleyball systems, scoreboards, and a host of other niche products. 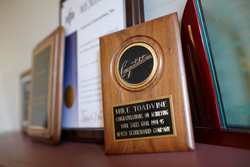 Today Toadvine Enterprises is still a family-owned and operated business. Both of Mike's sons are in the business. Chris Toadvine handles outside sales, alongside Mike, and specializes in the design and build of outdoor grandstand solutions. Ben Toadvine is in Inside Sales and specializes in selling Toadvine's maintenance and inspection services. Toadvine currently has a team of fifteen (15) full-time employees. You can read more about the team on our Toadvine team page. Toadvine Enterprises serves the Kentucky, Tennessee, Indiana, and southern Ohio markets. Although maintenance, safety inspections, and some after market sports equipment can be sold nationwide. We'd love to add you to our community of happy customers. Contact us today.